rate~ accepts an input signal from a phasor~ and time scales it by a multiplier received as a float in its right inlet. Numbers less than 1 create several ramps per phase cycle. Numbers greater than 1 create fewer ramps. This can be useful for implementing a phasor~-synchronized system in MSP. multiplier float opt The multiplier value used to scale the output signal. Converted to float in any inlet. In left inlet: Sets the phase value for the rate~ object's signal output. In right inlet: The signal multiplier value used to scale the phasor~ signal input. Float values less than 1.0 create several ramps per phase cycle. Numbers greater than 1.0 create fewer ramps. This can be useful for synchronizing multiple processes to a single reference phasor~ object, preserving their ratio relationships. In left inlet: The word goto, followed by a float, causes the rate~ object to jump immediately to the specified value. An optional second argument may be used to specify the time at which to jump to the value (e.g., goto 1.0 .5 will output a value of 1.0 at the halfway point of the phasor~ object's input signal ramp). The message oneshot 1 will turn on "oneshot"-mode whereby rate~ outputs only one cycle of a ramp. The message oneshot 0 will turn "oneshot"-mode off whereby rate~ can cycle through ramps continuously when instructed to do so (i.e. by the sync cycle message). reset In left inlet: The word reset will lock the output to the input on its next reset. It is equivalent to the message goto 0. 0.
signal In left inlet: An input signal from a phasor~ object. 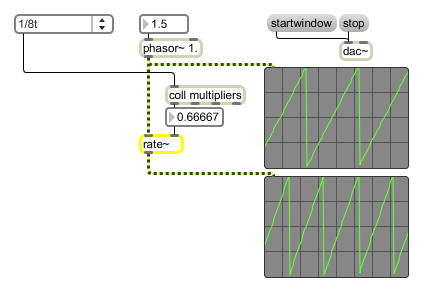 The rate~ object time scales the input signal from a phasor~ by a multiplier value. The multiplier value can be specified as an argument or received as a float to the rate~ object's right inlet. cycle: The messages sync 0 or sync cycle set the cycle mode of the rate~ object (the default mode). In cycle mode, the rate~ object does not change the phase of its output until the end of the current cycle. When the input ramp reaches its peak and starts over from zero, the rate~ object immediately restarts the output ramp, causing a discontinuity in the output signal, and immediate phase synchronization. lock: The messages sync 1 or sync lock set the lock mode of the rate~ object. In sync lock mode, the rate~ object performs synchronization whenever a new multiplier is received. The rate~ object immediately calculates the proper ramp position which corresponds to being "in phase" with the new multiplier value, and jumps to that position. off: The messages sync 2 or sync off disables the sync mode of the rate~ object. In this mode rate~ never responds to phase differences; when a new multiplier is received, the rate~ object adjusts the speed of its output ramps and they continue without interruption. Since this mode never introduces a discontinuous jump in the ramp signal, it may be useful if phase is unimportant. signal: The synchronized signal is sent out the outlet.